So far we have raised $995 on our GoFundMe towards the trail! We also have set the date for our Trail Opening for May 3, 2019! We hope to see you there! This trail will be suitable for a range of ages and abilities. Here at North County Land Trust (NCLT), we believe when it comes to having limited mobility, it’s the abilities that count. This is why NCLT is working to do everything we can to open up our natural spaces to those who may have mobility challenges. 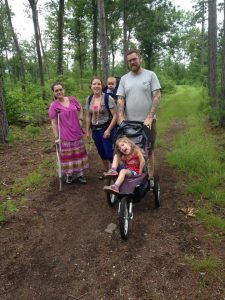 At our Underwood Conservation Area in Hubbardston, MA, NCLT is partnering with North Quabbin Trails Association (NQTA) to introduce a “Mobility Friendly” trail. While this trail will not be ADA compliant, it is designed to accommodate rugged wheelchairs (such as the GRIT Freedom Chair), those with braces/canes, families with small children, seniors and anyone else who needs wider, level trails, with frequent resting stops. The trail aims to enhance access to this serene wooded property, while maintaining a natural feel with a lightly natural surface. Our Mobility Friendly trail will follow fairly level terrain and will be improved enough to create a safe walking path. Three benches will sit along this 1/3 mile trail. Mobility Friendly Trails are designed for anyone who looks for wide, level trails and frequent rest stops. NCLT’s limited mobility trail project cannot move forward without your support! We need to raise $2,500 by May 1st! 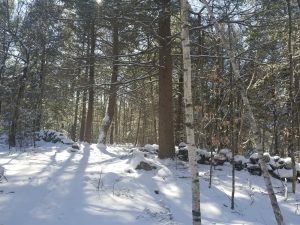 Help to make this trail vision a reality by donating at GoFundMe, or mailing a check to North County Land Trust, 325 Lindell Ave, Leominster, MA 01453 with “Mobility Friendly Trail” on the memo line. The Underwood Mobility Friendly Trail features beautiful stone walls and serene forests.